This is always my busiest time of year and I am currently fully booked until January. 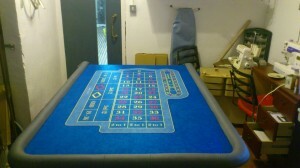 This week I am making a roulette table for my friends at the Pop Up Casino and re covering a sofabed. I am currently operating a waiting list as it’s difficult to know exactly when I will finish each job this far in advance. If you would like to be added to my waiting list please let me know as soon as you can and I will give you an idea of when I can start work on your project. Please have fabric and delivery arrangements ready. I will contact you with around a week’s notice so we can arrange a mutually convenient date to start work.